Who doesn’t love the holidays? Yes, it can be busy. But it’s an atmosphere that can’t be compared! Gifts aside, Christmas is the most wonderful time of the year because it brings people together. And alongside with the merriment and cheer, comes all the amazing holiday food. Well, here’s great news for everyone throwing parties this Christmas 2018. Party trays and packages are becoming a trend. Luckily, one of my favorite Spanish restaurants in Manila, offers Barcino’s Party Trays and Packages for the holidays. Food at Barcino was always meant to be shared – from special someones to special groups of friends. With Christmas around the corner, you can also share all the great food from Barcino at the comfort of your home or office. Looking to throw a party for 10-15 persons? Go for Barcino’s Party Packages. For as low as Php 500.00 per pax, savour a curated set of bestsellers from Barcino. 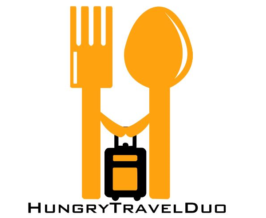 Want to pick your own viands? 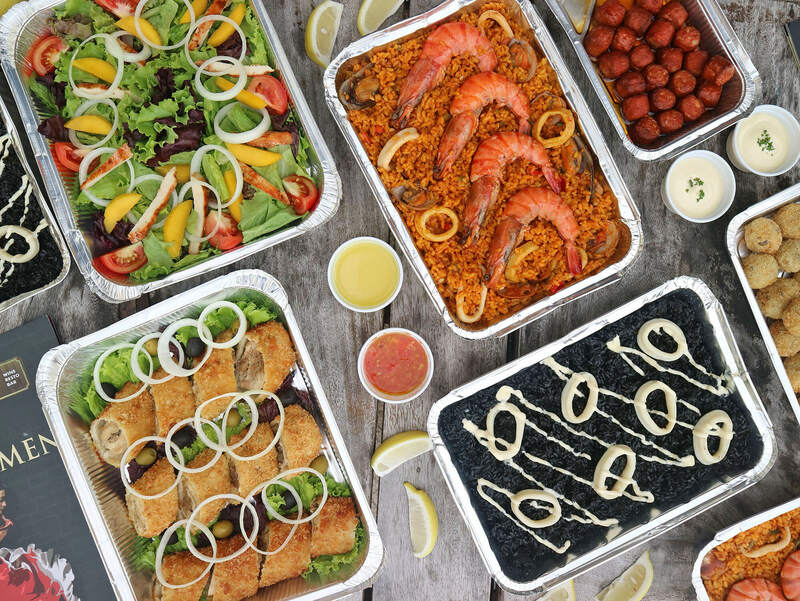 Go for Barcino’s Party Trays. Choose any food tray from Barcino’s food offerings. 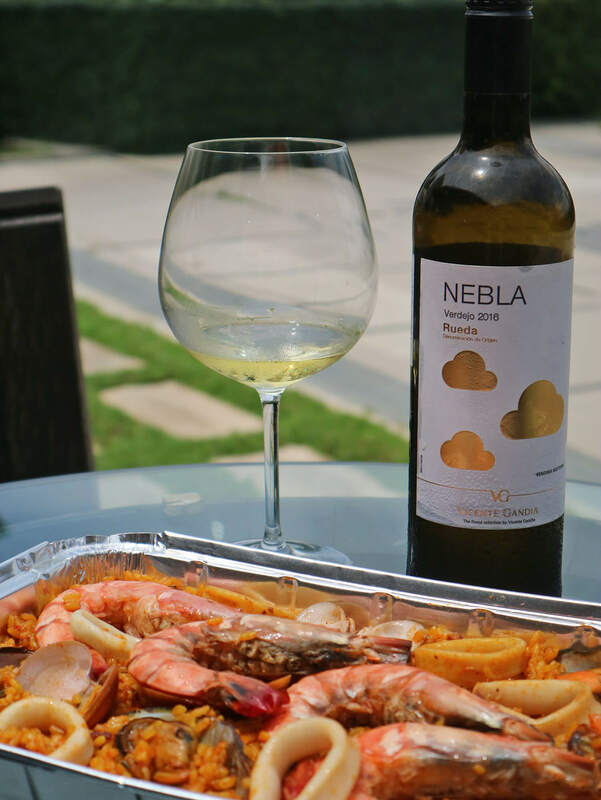 From Paellas, Tapas, Carnes, to Postres. You decide. Party trays are good for 10 and 15 pax. As of the moment, Barcino offers three (3) party packages for 10 and 15 pax. The Menu Catalan (Php 5,000/6,000), Menu Asturiano (Php 5,350/7,300), and Menu Gallega (Php 6,800/8,800). We had the Menu Gallega and it was a FEAST! The Menu Gallega of Barcino consists of Ensalada de Pollo y Mango, Croquetas Setas, Chorizo Picante Frito, Pollo Empanado con Queso, Paella Negra, and Paella de Marisco. 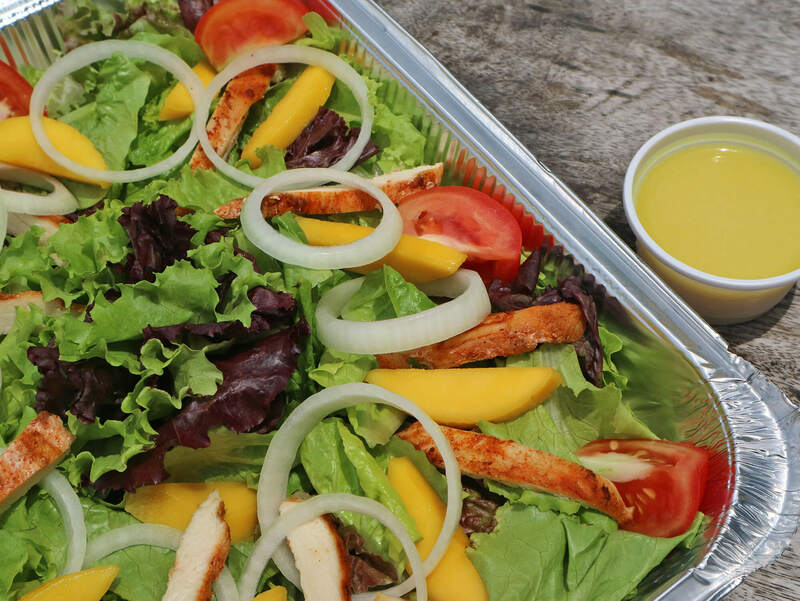 For appetizers, the Menu Gallega offers a crunchy mix of greens, topped with roasted chicken and mango chunks. The citrus vinaigrette definitely added a sweet and tangy flavor to the mix. 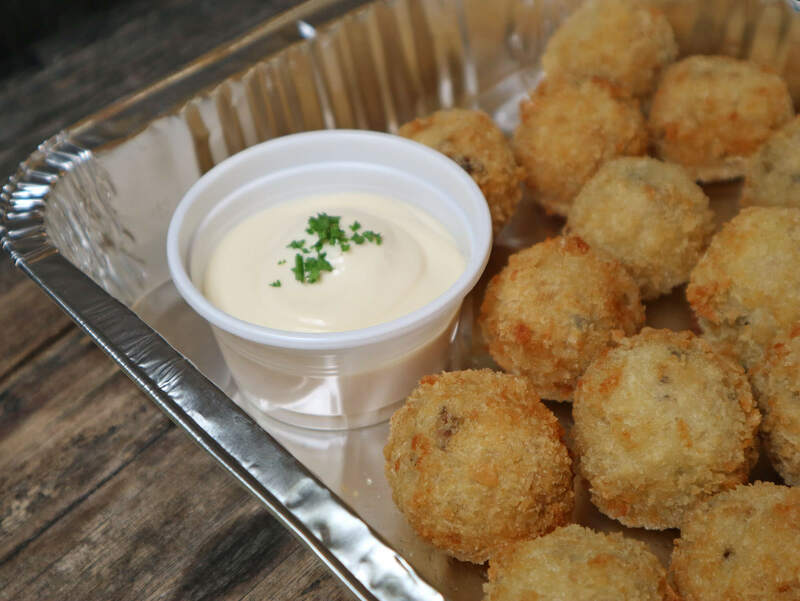 Love Barcino’s croquetas? 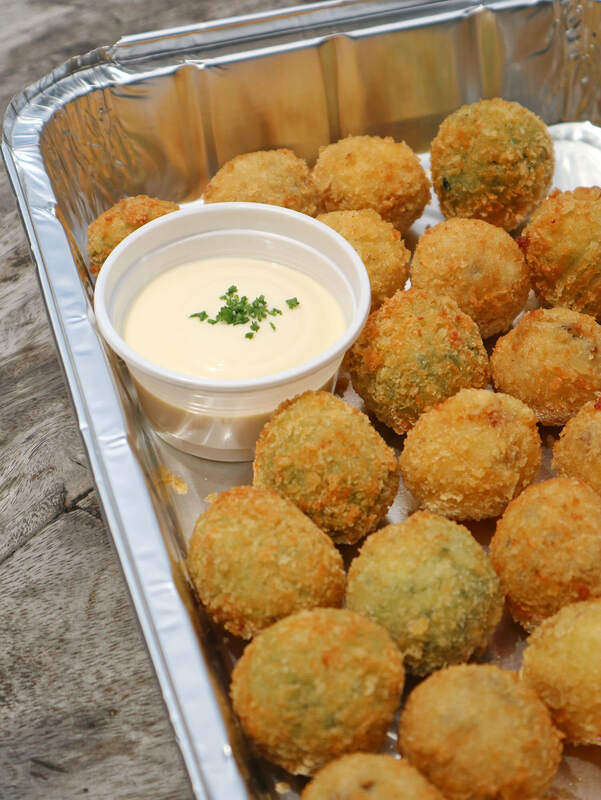 Don’t worry, this set has the Croquetas Setas (Mushroom Croquettes) in it. And they’re easily in my top 3 dish favorites. Loved how they’re nice and golden brown outside. While inside, a creamy mushroom filling is waiting for your delight. The spinach version was also very good! Love meat? 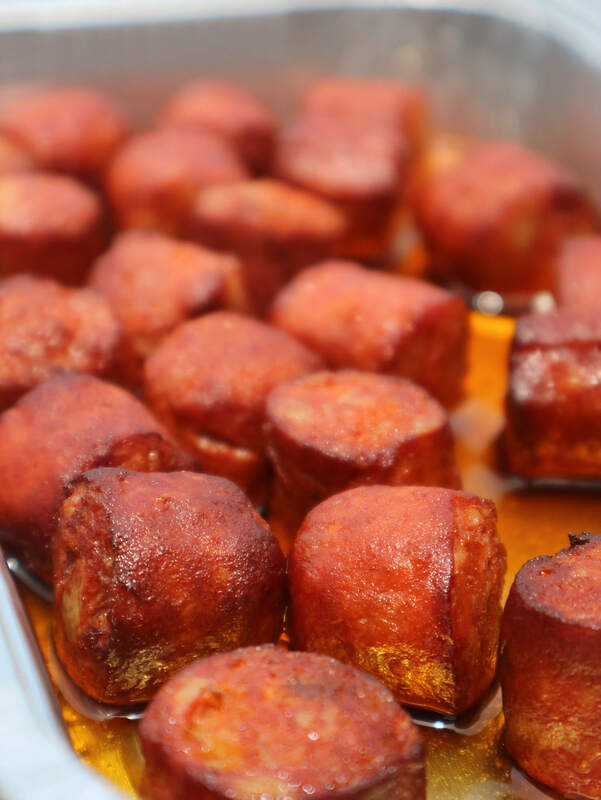 Then you’ll definitely pop a lot of the Chorizo Picante Frito to whet your appetite. They’re just a little oily for my liking but the smoky taste definitely made up for it. Love chicken? Have a piece (or two) of the Pollo Empanado con Queso (Breaded Chicken with Cheese). I don’t think I was able to taste this one but it sure did look very appetizing. 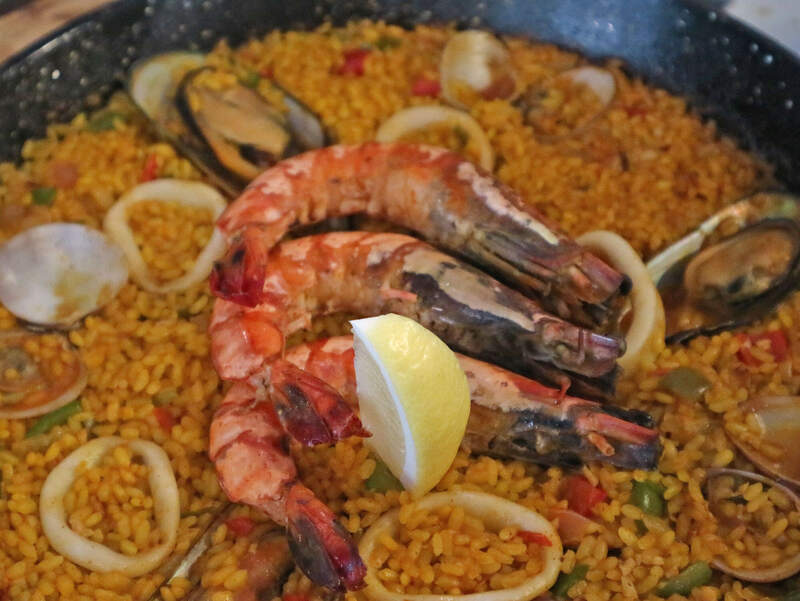 Of course, no Spanish feast will be complete without the famous Paella. 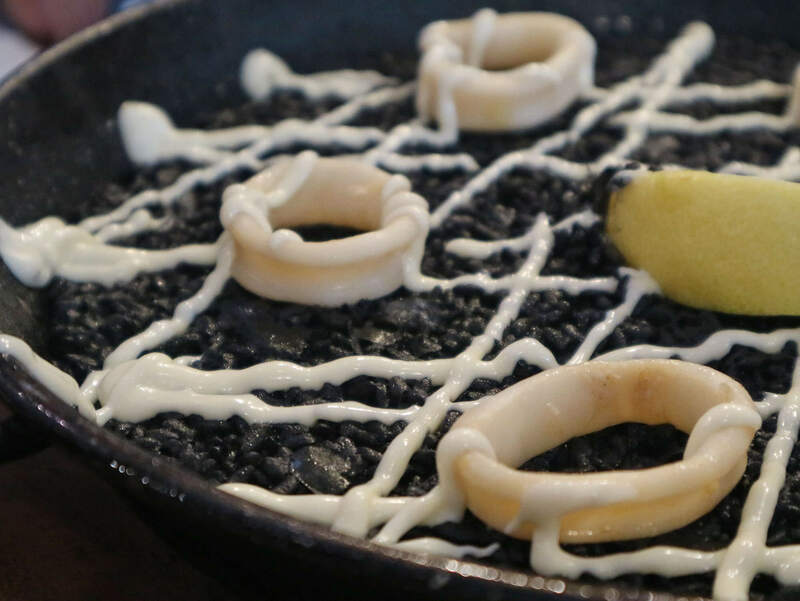 And good thing is that Barcino’s Menu Gallega offers two different paellas in the set: the Paella Negra and Paella de Marisco. Now I know the black squid ink can put off some people but trust me, the Paella Negra is pretty good! A lot of us actually liked this more than the other. And I can totally understand why. It was savory and had a lot of the juicy squid flavor in it. Personally, though, I found it to have too much mayonnaise and needed a lot of lemon to contrast to the dish. On the other hand, the Paella de Marisco (Seafood Paella) suited more to my liking. It had the perfect balance of flavor and texture. Plus points for the giant prawns that everyone highly coveted for! 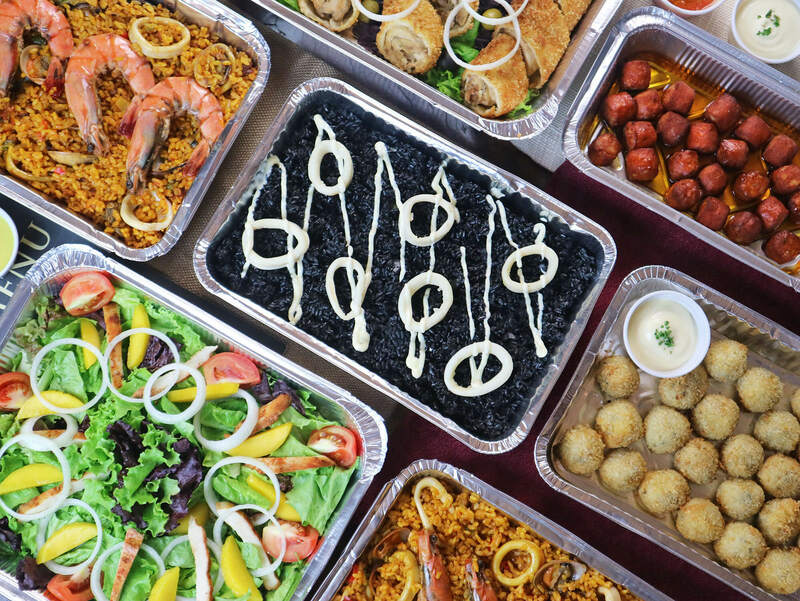 Customized according to your liking, Barcino’s Party Trays will definitely steal the spotlight. 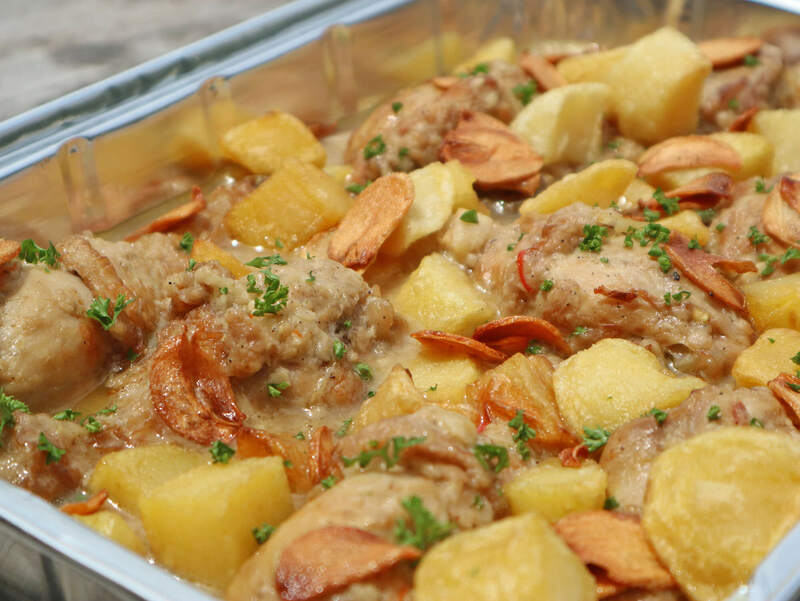 Order the Paella de Gallina y Cerdo (Chicken and Pork Paella) for only Php 1,300 for 10 pax. Or go big with the Paella de Mixta (Mixed Paella) at Php 2,600 for 10 as well. 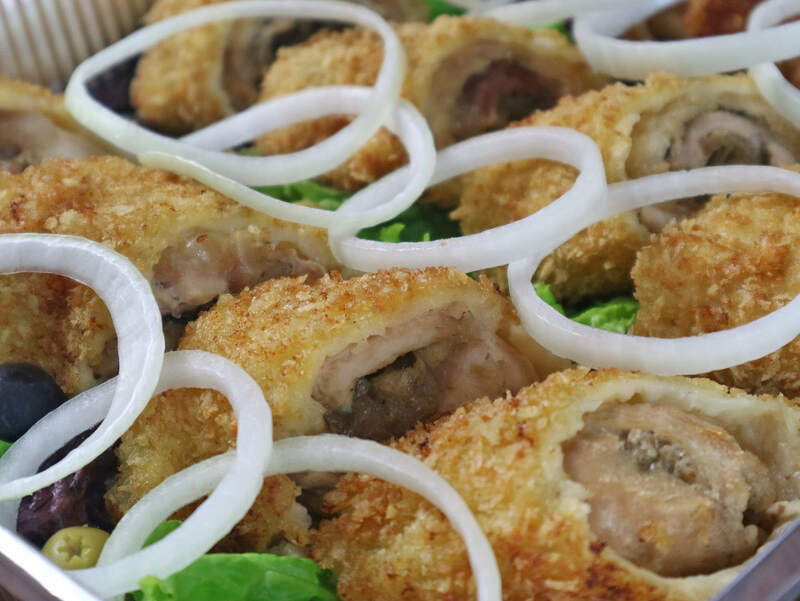 For tapas, score some Croquetas Mixtas for Php 1,100 for 10. Or maybe some Chorizo & Cheese Platter for Php 2,900 only for 10. For meat options, I definitely have my eyes on the Lengua Estofada con Patatas (Php 2,600 for 10). We had the Pollo Al Ajilo (Php 1,500 for 10) for lunch and it was just okay. I normally like my meat viands savory, so the citrusy/sour taste it had did not appeal much to me. To cap off the afternoon, we had the Barcino’s Tarta de Manzana (Apple Pie, Php 860.00 for 10). I super enjoyed how flaky and crunch the puff pastry was. While the apple filling was creamy and had the perfect level of sweetness. The cinnamon topping was good addition too! 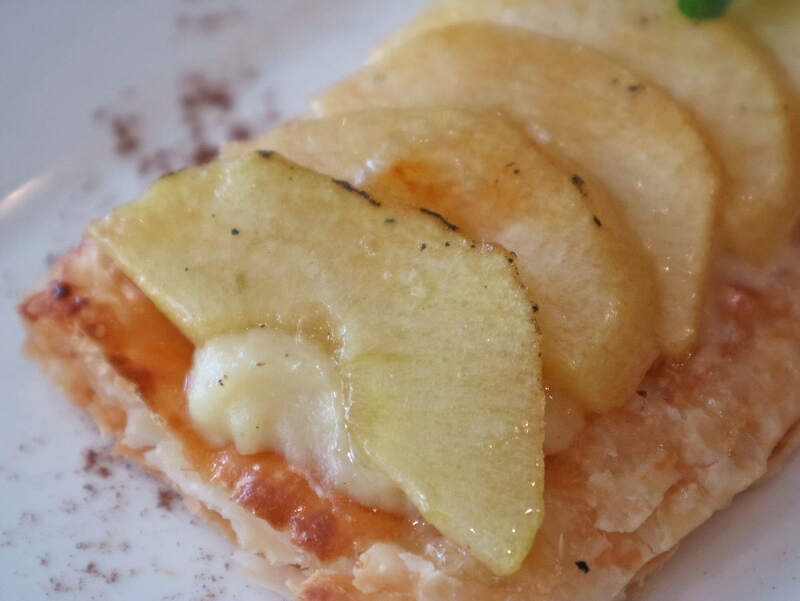 Barcino’s Tarta de Manzana (Apple Pie, Php 860.00 for 10). All in all, I’d totally recommend Barcino’s Party Trays and Packages. They’re meant to impress on taste, without breaking the bank. For additional information,please visit their Facebook page. For events and catering, please call 0917-7045206 or e-mail eventsandcatering@rcgi.com.ph.